To frost them, simply hold them in your hand and dip them upside down into a bowl of icing. Shake on some candied sprinkles, let them set for an hour and you are ready to go. You can use different flavored extracts (vanilla, almond, orange, peppermint, etc.) for different flavored frostings. Beat butter, cream cheese, and sugar until light and fluffy. Beat in eggs and vanilla. In a separate bowl, mix flour, baking powder, baking soda, and salt. Mix into butter and sugar in mixing bowl. If the dough is too sticky to roll into balls, refrigerate dough for 30-60 minutes. With hands, roll dough into 1” balls for small cookies, slightly larger for larger cookies. Place 2 inches apart on baking sheets. Flatten dough balls slightly with the palm of your hand. Bake for 7-9 minutes. Do not overbake. Place butter and cream in a microwave-safe bowl. Heat in the microwave for about 60-90 seconds, until butter melts. Use a whisk to mix in powdered sugar. If you are making more than one color or flavor of frosting, divide frosting into separate bowls. Stir in extract (if you want to use white icing, use a clear vanilla or other flavored extract). Mix in food coloring. 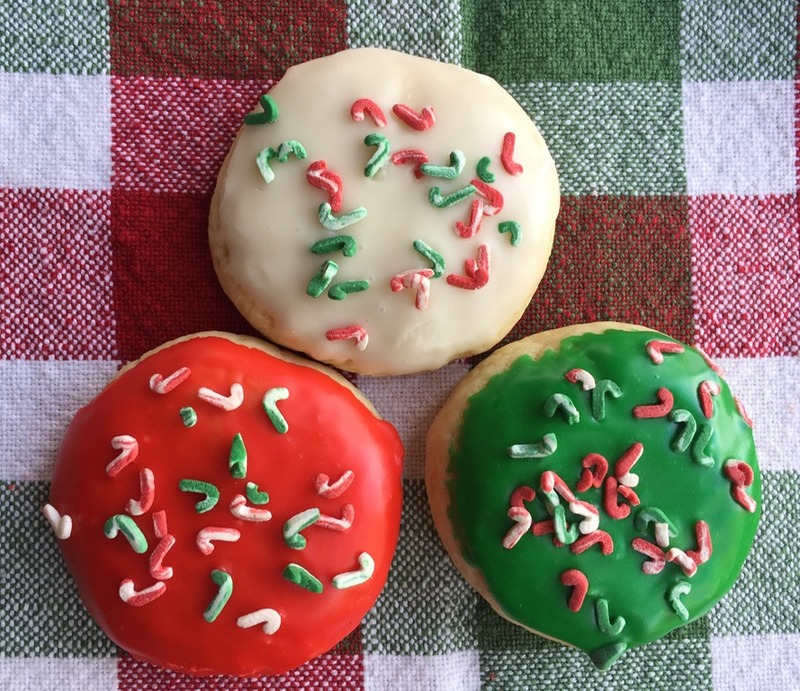 Dip tops of cooled cookies in warm glaze and place on a sheet of waxed paper. 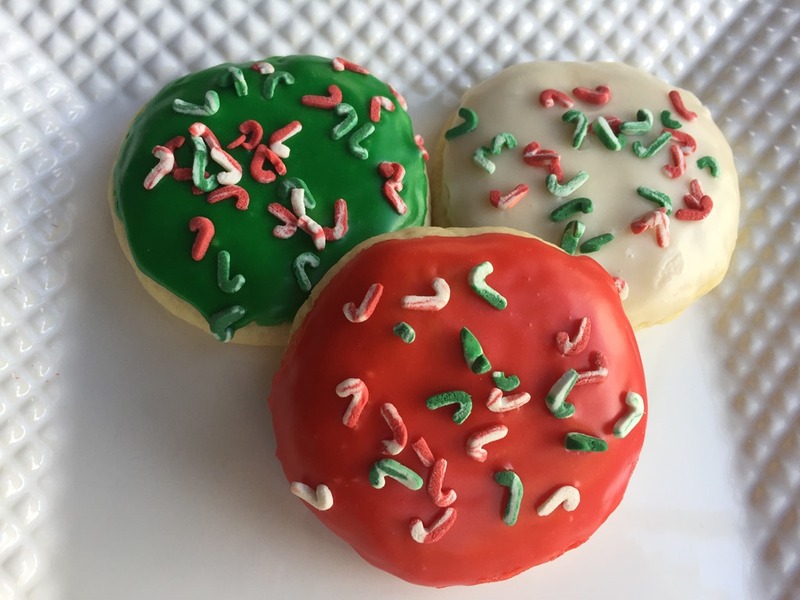 Sprinkle immediately with candy sprinkles (the glaze starts to set fast: dip one cookie, then add sprinkles, then dip another cookie, etc). If glaze gets too thick, heat in microwave for 15-20 seconds. 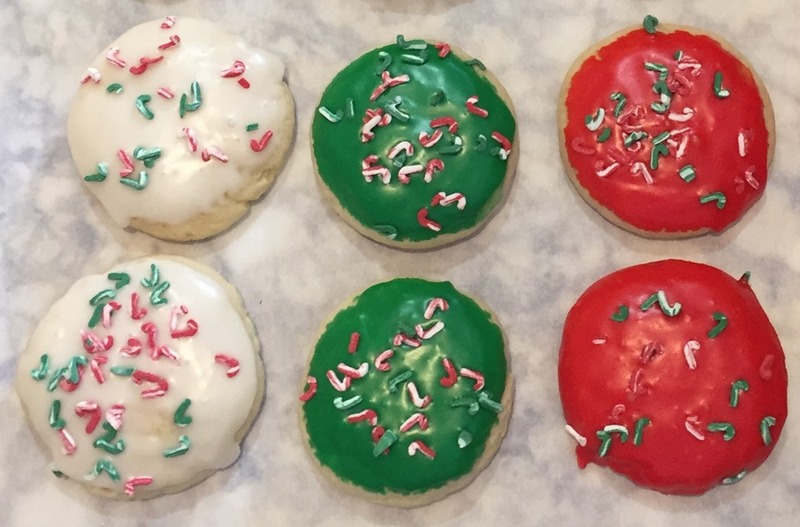 Allow glaze to set on cookies for about 1 hour before storing cookies. To freeze: Freeze cookies in single layer and then place in container and store in freezer. Thaw cookies in a single layer.